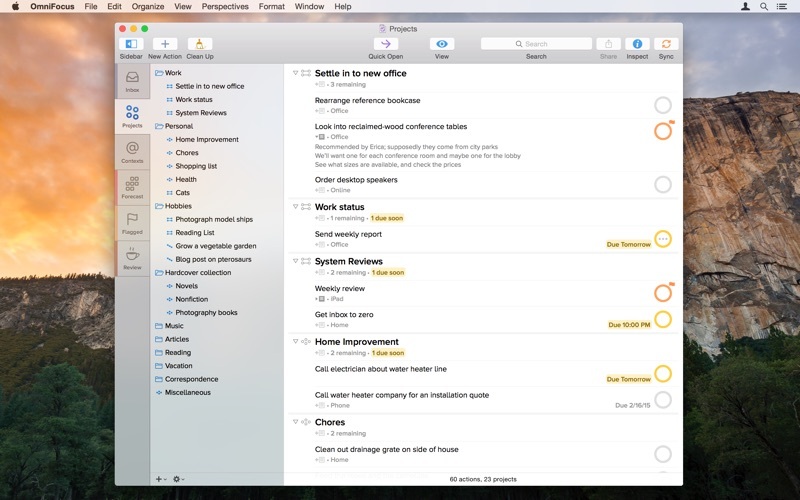 Live a productive, contextual life with OmniFocus 2 for Mac. Keep work and play separated with contexts, perspectives, and Focus. Ignore the irrelevant, focus on what you can do now, and accomplish more. And do it all much faster than before. 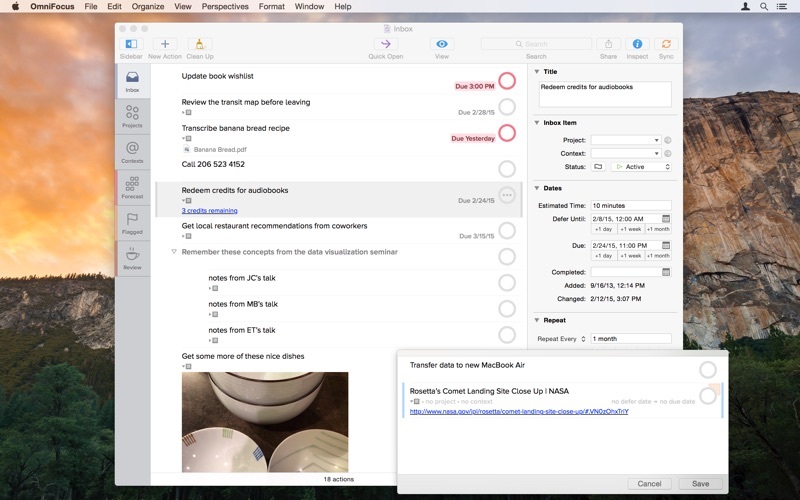 OmniFocus' interface was designed and organized around your data—your stuff—to make it easier and more natural for you to quickly get ideas into and out of the app, whether you’re using Getting Things Done™ (GTD™) or any other productivity system. It's powerful enough to use on its own, and syncs through the cloud with your other devices running OmniFocus (also available for iOS and Apple Watch). • Reliable sync with NEW push triggering using our free service or your own server. Keep your entire database at your fingertips by syncing with OmniFocus for iOS and Apple Watch (available from the App Store as a separate purchase). • Customizable Layout: Choose a fluid view that automatically shows and hides fields as needed, or use Custom Columns for scannable, tabular lists. 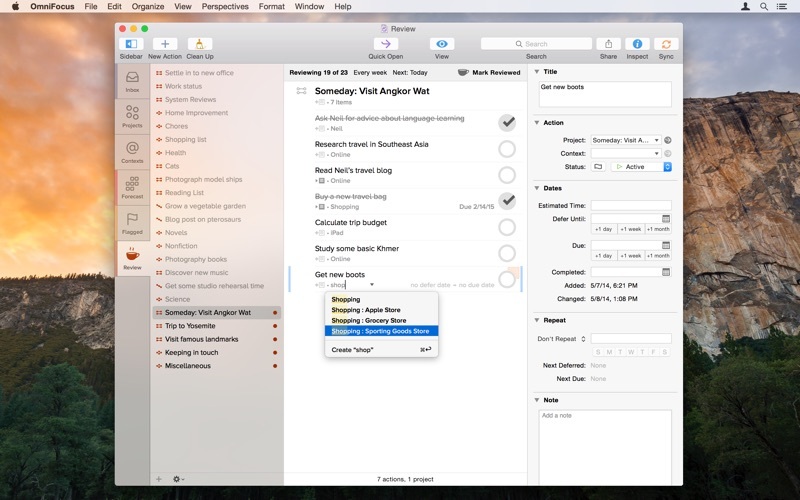 • NEW Customize OmniFocus' look with the colors and fonts of your choosing. • Attach (or link to) important reference material. 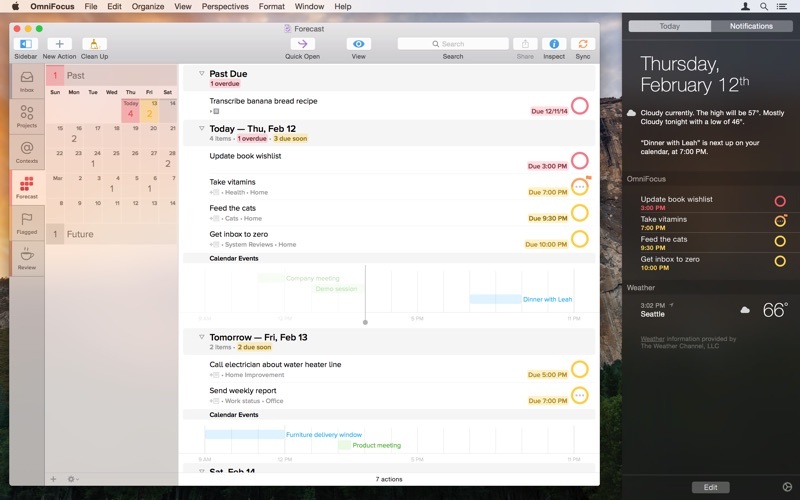 • Open the Forecast perspective to see your due items for each day alongside events from your OS X Calendar. • The Review perspective (NEW IN 2) makes sure nothing falls through the cracks. • Customize the OmniFocus sidebar and home screen just like you customize your iOS Device's home screen. • AppleScript support enables all kinds of cool workflows. • Focus feature lets you block out stuff that isn't immediately actionable. For more information, please watch the video on our website! If you have any feedback or questions, we’d love to hear from you! The Omni Group offers free support: you can reach us by email at omnifocus@omnigroup.com, by phone at 1-800-315-6664 or +1-206-523-4152, or on Twitter at @omnifocus. If OmniFocus empowers you, we would appreciate an App Store review. 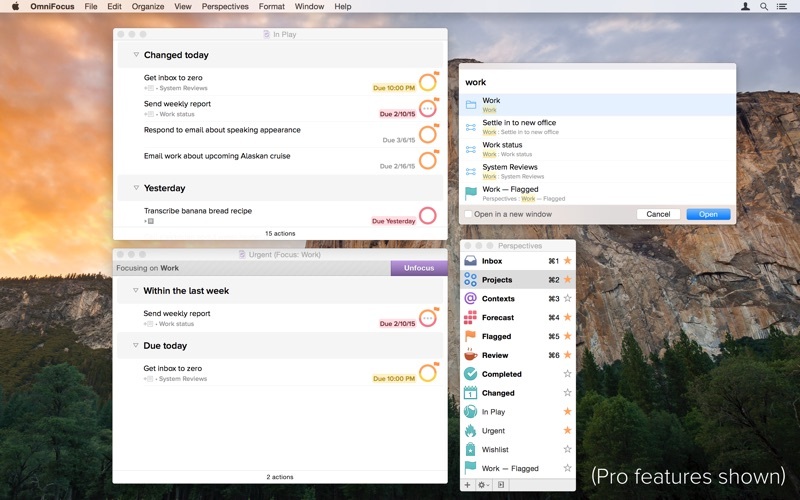 Your review will help other people find OmniFocus and get more done. 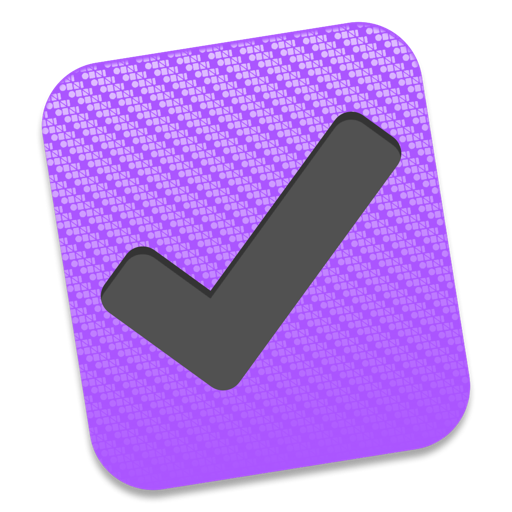 OmniFocus 2.7.1 is a minor update focused on bug fixes.